Synthetic Fertilizers - What's Wrong with Them? The small percentage of high nitrogen fertilizer that gets into plants forces fast growth that results in weak, watery cell growth and sick plants. Plants grow and flower in the short run, but the imbalance and the weak cells that are created bring on insects and diseases. Plant health is decreased long term. Nature’s job is to take out sick plants and to encourage the survival of the fittest. Synthetic nitrogen pushers advise people to buy products where the slow release portion of the product is in the 60% range. The artificial attempt to slow these fake fertilizers down is humorous. If they would use organic fertilizers, 100% of the fertilizer would be in the slow release form. Organic fertilizers contain N-P-K, trace minerals, organic material, humus and beneficial microbes - and that's all good. The worse possible choices? 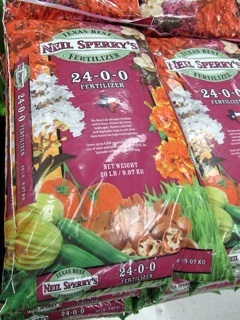 1) Chemical weed-and-feed fertilizers, and 2) Nitrogen-only fertilizers such as 24-0-0. Too much phosphorous has become a topic of concern to those who don't understand soil health and we will discuss that in next week's newsletter.